You have heard of the terms, a gaggle of geese, a pack of dogs, or a pride of lions? Right? So what do you call a bunch of rabbits? Actually, they were jackrabbits, so they would be called a husk of jackrabbits! Which is what we had last weekend in Asti. I counted 3 adult bunnies taking shelter from the 105 degree heat near the house. They were so hot, they didn't even run away when we got near them! I felt so sorry for them. But not as sorry as I felt for this little bunny that my granddaughters discovered in the lawn. Poor thing, he must have been abandoned by his mom in the heat. What to do with him? If we left him there, he would surely be eaten by a hawk, or die from heat exhaustion. After much discussion, we decided to capture him and get him out of the sun until his mother reclaimed him. It was all very exciting! The girls gave him carrots and water, and we kept him in the shade for the afternoon. Later, we released him nearby a grown rabbit, which was probably hanging around looking for her baby. A few hours later, he was gone. The granddaughters would like to think that they found each other and lived happily ever after! Awww, poor bunnies. I'm sure, like your granddaughters, that when it got cooler the mama came back for the baby. Sweet post. Bunny Wabbits are so irresistible, aren't they? A memorable afternoon for your granddaughters, I'm sure. Poor baby wabbit. Hope he made it back to Mama. 105? wow, so sorry. Beautiful images and a great story of kindness. How sweet and such a nice gesture...sweet little bunny! My goodness those rabbits can get to be very large I think. The young rabbit is cute. I'm surprised you got so near it. That was a good thing you did. Now, something good will happen for YOU! Awe.. sweet, and good for you ! We live out in the country and we are trying to help with the birds lately... extra feed, hummingbird food etc. Those are good looking hares, or jackrabbits as you say, they must have been exhausted to be so docile - hope they're not munching your garden! I always learn so much from you! A warren of rabbits.... I will need to remember that when I'm on Jeopardy someday! I too hope that Mother and Baby were re-united. Perhaps the rabbits were just hanging out, admiring your lovely home there in Asti???? A warren and a husk! I can't say I've ever heard that before. How interesting. I hope your husk of jack rabbits don't eat your vegetation like the little cute bunnies in our neighborhood do. They are a complete nuisance and no way to get rid of them. My garden is filled with jackrabbits right now. Aren't they the cutest? I have observed that they tend to hold still when I come into the yard. I think it is because they think that if they are still I will not see them. 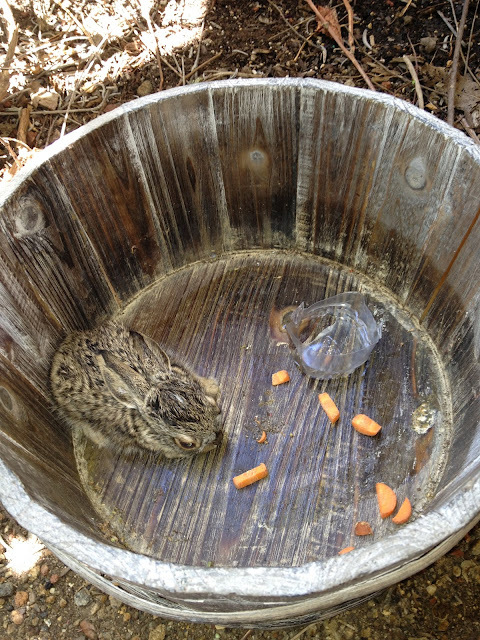 Tell your granddaughters I am sure they saved that little bunny's life. Oh, poor little rabbits! That was so kind that you rescued the little baby and took care of it! I hope the baby found it's mommy too! I love these pictures. I love rabbits, even though the little cottontail rabbits in our area eat lots of flowers and plants, I still think they are fun and darling. So nice you rescued the little guy. the wonderful thing here is that your grandchildren are learning about wildlife! so nature preserve,,,,,here we come! Love the bunnies. We had to help one that out cat brought in. It was fun nursing it to health and setting it free in the old English garden of an abandoned estate within walking distance. Enjoy your posts! I would bet money that the baby rabbit is just fine---we have a warren in our canna patch; they've been there for years. Every year we see a few wee ones like this venturing out on their own. If you walk up to them, they go "tharn," but eventually they get used to you and you have to go shoo them away from the herbs. What wonderful pictures! You are an inspiration! I am sure that was the mother bunny! What I did not know; is that "ground squirrels" (why we plant in chicken wire around the 'root ball') make the tunnels that the bunnies use to have their baby bunnies! And the bunnies can be running all around....they are Beautiful!